Scottish First Minister Nicola Sturgeon, the head of Scotland’s government, will not meet with President Donald Trump during his visit to the country. Instead, she’ll be marching in Glasgow’s pride parade as Grand Marshall. 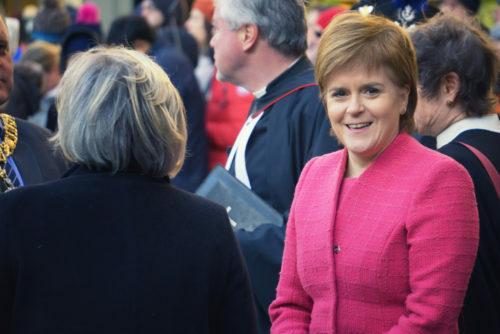 “I’m proud that Scotland is considered to be one of the most progressive countries in Europe regarding LGBTI equality and Pride Glasgow is a fantastic event that brings communities together and celebrates all that LGBTI people bring to Scottish life,” Sturgeon told STV News. She will be the first serving prime minister or first minister in the UK to march in a pride parade. Scottish Secretary David Mundell will welcome Trump instead of Sturgeon. She is not expected to meet with him during his stay in Scotland in a public diplomatic snub. Trump, meanwhile, is expected to head straight to his golf club so he can relax, play a few holes, and try to destroy the world one tweet at a time.